Even though average days on market (DOM) are historically at their longest in January, 33 percent of DSF and 43 percent of ASF homes were under contract in 7 days or less. 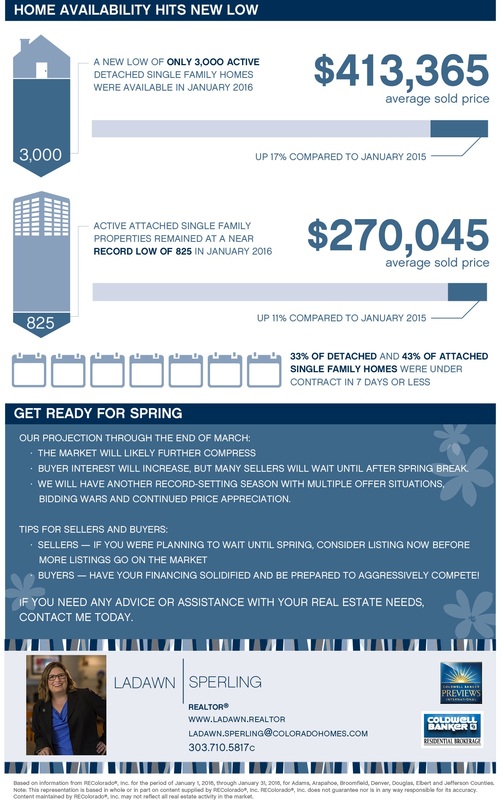 Through the end of March, the market is expected to further compress as buyer interest picks up while sellers wait until after spring break. We anticipate another record-setting season with multiple offer situations, bidding wars and continued price appreciation. Sellers who were planning to wait until the spring are encouraged to consider listing now before more listings go on the market. Buyers should have their financing solidified and be prepared to aggressively compete. If you need any advice or assistance with your real estate needs, contact me today. Based on information from REColorado®, Inc. for the period of January 1, 2016, through January 31, 2016, for Adams, Arapahoe, Broomfield, Denver, Douglas, Elbert and Jefferson Counties. Note: This representation is based in whole or in part on content supplied by REColorado®, Inc. REColorado®, Inc. does not guarantee nor is in any way responsible for its accuracy. Content maintained by REColorado®, Inc. may not reflect all real estate activity in the market.